← A Visit to Historic Yates Mill Park in Raleigh! 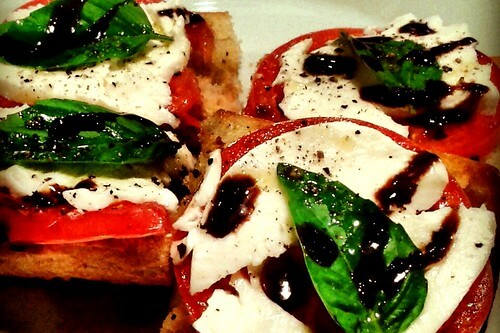 Sola Coffee & Cafe’ Introduces New Dinner Menu! If you follow me on instagram and twitter then you know I am no stranger to Sola Coffee & Café. 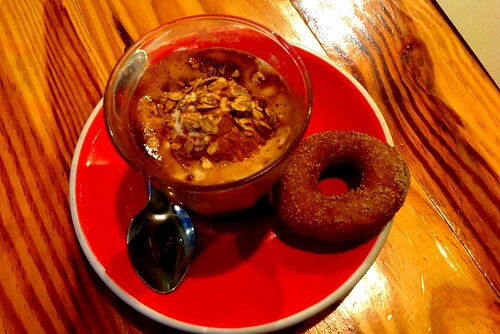 They are one of my “go to” places for great coffee and espresso drinks in Raleigh. Yet my pictures of coffee and cool latte art only tell half of the story at Sola. Over the past year Sola has blossomed into a great café with a creative and ever growing food menu that now offers great options for the dinner crowd in addition to their already well known breakfast and lunch offerings. If you follow Sola on facebook you will often catch updates about the homemade soups they offer, like this weeks vegetarian chili! 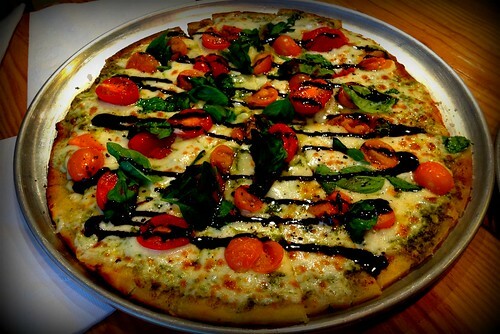 My current favorite new menu item at Sola is the White Garden Pizza (pictured above) with mozzarella cheese, cherry tomatoes, spinach, pesto, basil and a flavorful balsamic glaze. As with all their menu items, the ingredients for the new dinner options are always fresh in addition to locally and regionally sourced whenever possible. With the addition of new food items, Sola has also started offering a select menu of locally brewed craft beers and several great European wines. I love the local beer scene in the Triangle and am thrilled to see Sola offering brews made by some of my favorite local places like LoneRider Brewery and Big Boss Brewery. 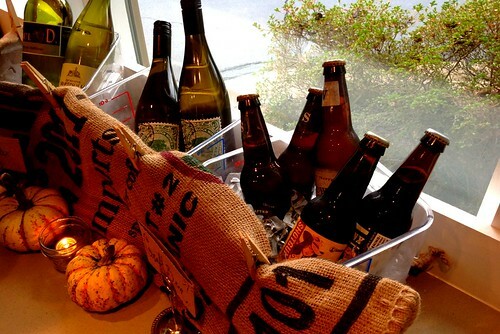 If you are more of a wine drinker they have a nice selection of whites and reds to enjoy with dinner. I’m a big fan of gruner veltliner wines out of Austria. I find the spicy fruitiness and dry finish of a gruner makes for the perfect white wine to enjoy during the colder fall months. If you have been following my blog recently you know I have been writing a bit about upcoming marathons and half marathons I am preparing for. Part of my training is about eating better and that includes eating more healthy salads. Fortunately I have found lots of great salads at Sola. I particularly enjoy their mixed green salad (shown above). 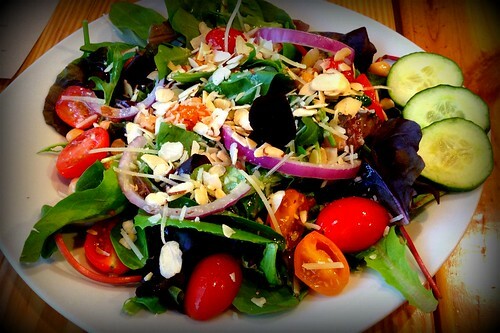 It has a healthy portion of mixed greens along with cucumber, cherry tomatoes, almonds, red onion, and garbanzo beans. The homemade dressing is fantastic and is made using a secret recipe! Of course, just because I am eating healthier these days doesn’t mean I can’t enjoy a treat now and then. There are several sweet options to enjoy at Sola including yummy affogatos (espresso shot poured over a scoop of ice cream) or a slice of cheesecake or chocolate cake. They also now offer a gluten free apple crisp desert which I think is great. It is very yummy and I appreciate the fact they provide options for people with dietary restrictions looking for gluten free items. 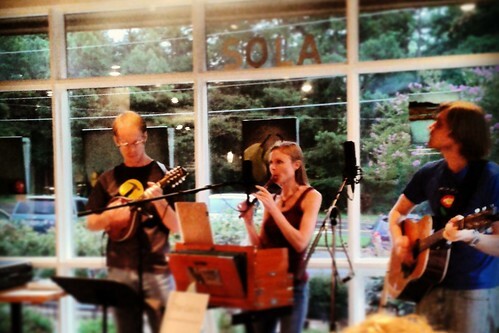 If you are looking for a fun date night location in North Raleigh check out the Live Music scene at Sola. They typically have live music each Friday and Saturday night starting around 7:30pm. I’ve heard everything from bluegrass and Jazz to Celtic music played at sola. It is great to see the community support great local artists and I love that there is a great place to grab dinner and hear live music in North Raleigh now on the weekends. Visit their events calendar to keep up to date on the live music schedule. 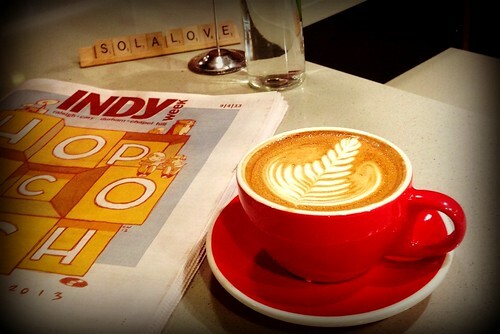 Of course no matter when you visit Sola you can always enjoy a great coffee or espresso drink. My current drink of choice is the cappuccino. I always make sure I leave room for coffee after dinner! To learn more about Sola and keep up to date on their special events and new menu items visit their website and follow them on facebook. Make sure you stop by Sola this week and pick up your free invite to their “Thank You Raleigh” celebration scheduled for this Sunday, November 17th. The invite is good for one free drink at the event – donations will be accepted to support the Friends of Guardian ad Litem Program of Wake County and the children they represent. You know this is going on the bulletin board ;). Thanks for help putting Sola on the map. I never knew about this place until I reading your posts and mentioning it. The ownership is top notch that really cares about their guests. Now I’m craving their BLT. John – great review. 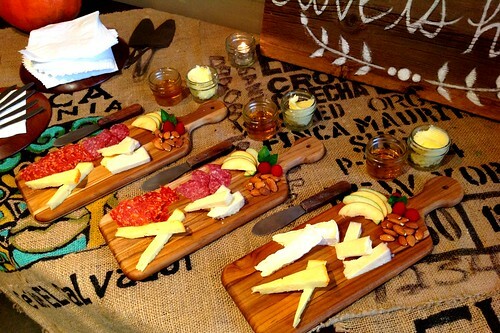 I only go to Sola for coffee but I’ll plan a dinner there soon! Hope to see you at run club next week! Art, Too funny. I will have to keep on eye on the bulletin board. Glad you have been enjoying visits to Sola. Now you have me craving the BLT! Thanks for checking out my post about Sola. I know what you mean. I’ve been enjoying coffee there for some time now, but have to try eating there more often. There are still a few items I have yet to try!